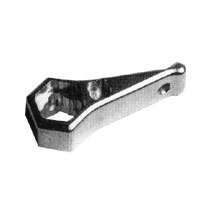 Key Chain Wrench That Fits Bolts On Most Fixtures. The Mega-Combo Wrench is designed to keep you out of trouble. How many times have you needed to move a light but you didn't have a wrench? The Mega-Combo has a hole to attach to your key-chain, or drop in your pocket so you can always keep it handy. The Maga-Combo will allow you to move the light from pipe to pipe, tighten the pan bolt, and lock the tilt on most fixtures. It will even lock the small side square headed bolt on 99% of the old cast iron clamps and will also fit the bolts of the Micro-Clamp. (Fits bolt head sizes: hex 3/4" & 1/2"; square 1/2" & 5/16") The Mega-Combo weighs only 1.4 ounces and is 2-3/4" long. It is machined from a solid aluminum alloy to be trouble free for years and has a bright burnished finish.